Shortly after moving in, I experimented with countertop paint in my kitchen. See step by step what this $20 product looks like, get the DIY tutorial, and see what it looks like now! Yep… I’m not even going to try to make a pun about this. I painted my kitchen countertops this weekend. If you haven’t been reading this blog long, you may not remember my kitchen story from when we first moved in. Long story really short: Ewww. The kitchen ceiling was orange from years of smoke damage; the floor was yellowed linoleum. The fridge was filthy and I found one of those lovely fingernails you’ve heard me whine so much about. And the countertops were caked on with so much grease and dust we had to use oven cleaner to remove it. I think I make a pretty good case for why someone would want to paint everything just for the sake of freshening up the place rather than waiting on the true demo and remodeling to begin. I first heard that painting laminate countertops was possible after reading this post from Brooklyn Limestone. Painted countertops? How? Or more importantly, how much? I’d seen “countertop makeover” kits at Home Depot, but at over $200 a pop, I wasn’t ready to take the plunge. Maybe we haven’t covered this before, but I’m cheap. If you want me to spend $200, I’m making sure it works first. But much to my surprise, this particular countertop paint product wasn’t $200; it was more like $20. I figured if I’m replacing the countertops anyway, it wouldn’t be so bad if I experimented a little and tried out this paint as a temporary fix-up… a little lipstick on my kitchen pig, if you will. If I hated it, the wait to replace it with something better would be short-lived. No commitment necessary. No, I didn’t go crazy with the color, but I did use this painting project as an opportunity to figure out how light I would like the countertop to be. Did you have to guess which color I chose? Yup. gray! It’s a sickness, people. 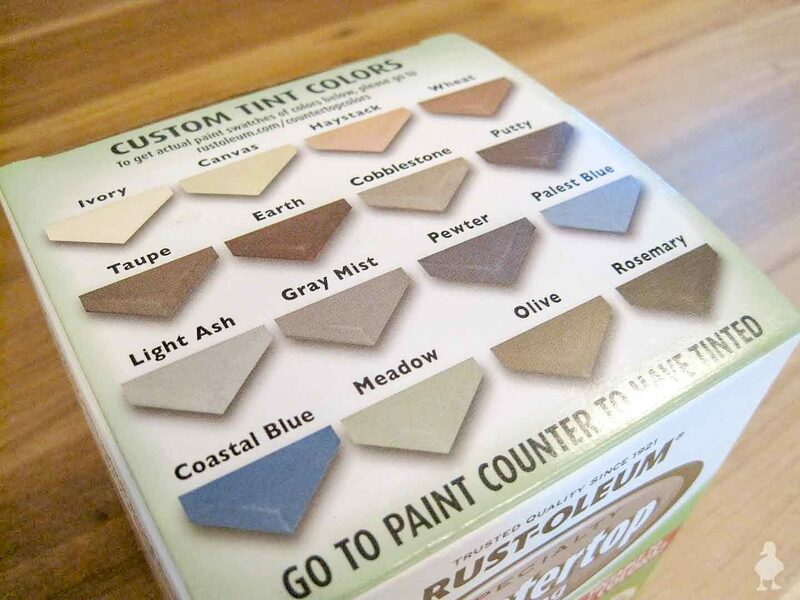 In all fairness, this painting product from the Rust-oleum crew has only sixteen color options. Three of them are shades of gray. I chose the middle gray tone, called “Gray Mist”. During my limited time researching this product, I’d learned from user reviews that this stuff was pretty toxic and would take three full days for the paint to cure. Not only that, but the paint would not require priming if I were painting over laminate (which I was) and would stick to just about anything it touches, so it was important to protect anything I did not want to bond with the paint. Like my precious floors. Three old bedsheets drop cloths later, I was ready to begin. Knowing how toxic this little painting adventure would be, I prepared myself with the basic tools: gloves, breathing mask, foam roller, etc. I found that the paint stick really came in handy on this project. Even though we had a warm weekend (yay! ), I had read that the paint consistency would be important if the temps were going to drop lower as the paint dried (per the can’s instructions, you should only use this product when temps are between 50 and 90 degrees for three days in a row). I found that the color separated from the tint base quite easily (I’d only bought the paint two days before painting), so stirring it up was key. The paint seemed pretty thin as I ran through it with the foam roller (picked for it’s “smooth finish” promises on the packaging), but as I applied it to the countertop, I found the coverage to be quite thick. As you can see in the pic, I wasn’t exactly trying to color in between the lines; I just slapped on paint where I saw fit. I wasn’t trying to hard to make things perfect or protect anything except the floors or appliances. I got too close to the stove only once, and found that if I wiped it up quickly enough, a damp paper towel took care of it fairly well. Despite my lovely accessories, I could still smell the fumes a little too much. Just warning ya, but this. stuff. REEKS. I kept the windows open all night despite the dip in temperatures just so the fumes wouldn’t be hanging out in the house while I got ready for work the next day. Not exactly the wake up call I would prefer, know what I mean? This was taken at night just before I went to bed, so I’ll try later this week to give you a better “after” shot so you can see the color and finish a little better. Just for the fun of it, I’ll give you a Before & After split screen as well. I painted this little counter beside the fridge as well, but forgot to take an after pic. And for the ultimate question: how do I like my results? The answer: meh. I wasn’t expecting miracles, and I wasn’t 100% in love with the results. The finish was consistent and felt dry to the touch after just a couple of hours, so I’m sure in the three days that it takes to cure, the paint will stick quite well and wear nicely over the next year or so (before I replace them with an upgraded material). I did notice that there were certain areas where the paint appeared to bubble a little, but I think that’s probably my fault for not waiting until the temps got a little higher before trying this out. On the bright side, I don’t think I want to go gray with the countertops, and it cost me only $20 for a test drive. Once I paint the cabinets a lighter color, I don’t think I want to go in the mid-tone range for countertops; either extremely light or extremely dark is what I’m thinking, just so there’s contrast. And it’s really motivating me to get rid of those dated oak cabinets. I’m thinking white with that gray wouldn’t look too bad. What do you think of my little paint misadventure? A brilliant and inexpensive solution to nasty “I would never eat on that” countertops, or would you have saved yourself the twenty bucks and lived with the old countertops as-is for another year? Anyone out there who didn’t realize this was possible but are considering painting your countertops now? Let me hear it. About six months after, I reviewed the condition of the counters to see how they held up with normal use. Want to see the results? Click here. What the kitchen looks like now! Thanks for sharing this. We have really awful cream colored vinyl counter tops that we eventually want to replace, but this might be a great interim solution. lol your kitchen pig! sounded easier than i thought it would be. i think i would have tried a warmer color but it looks good from the pictures. I think I would have given it a shot, too. If the old countertops are about to be thrown anyway, why not? And twenty quid are a good teal for just testing it. There's a telly advert over here with a bit of adventurous wisdom in it: For those who'd rather give it a go than never know. @Jen: Yeah, the warmer color would have looked better with the oak, but I'm planning on painting the cabinets soon anyway. As soon as the weather warms up! 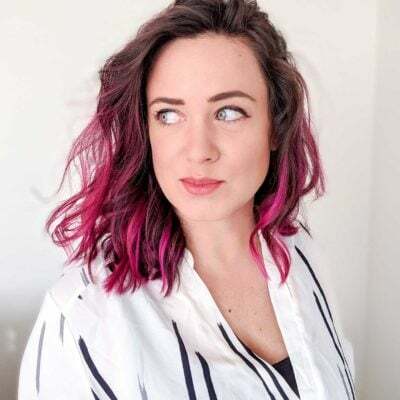 @lisbonlioness: There's nothing about what you said that I didn't like! Love that phrase! Thanks for posting about this – I've been intending to paint or do a tile mosaic on our countertops in our basement (mostly the bar). We've been in our house almost 2 years now, and they're still the same faux horrible black and green laminate. Yuck. I've been putting it off because I was convinced that I wanted to do a tile mosaic, but until I have the huge time requirements and – I'll admit it – motivation to do it, I've been pondering painting the countertops. Thanks for the temp info, too – looks like this is one project that will need to wait until Spring – or Summer (it's pretty cold down there)! I've been staring at the scarred up surface of my beloved IKEA dining table wondering how to make things right between us- I think you just answered my prayers! That's a huge improvement! Sorta reminds me of a concrete countertop. Nice work! Ok awesome! I can definitely relate to all of that dark trim!! Wow, looking at your before/afters make me want to get on the remaining dark trim in my home! I found you through New Nostalgia. I just started blogging in January and have been enjoying this warm weather in Atlanta too! My flowers are already starting to come up!! We are most likely going to rent our current home when we buy a new one later this year. We are moving towards NOT updating the kitchen b/c we think renters over the years would just ruin it. I think this might be the answer I'm looking at for giving the countertops a little bit of an upgrade without going full out. Right now they're white, scuffed up laminate. Thanks for the info!! I appreciate your honesty on what you thought. I read parts of it to the hubby and then I got to the end. He said-“I appreciate she was honest”. I also means he won't have to work. Great post. I've seen this done on another blog a while back and that blogger was mostly pleased with the results as well. I will be doing a complete renovation of our kitchen this spring/summer and am trying to keep costs as low as possible until the hubs and I decide if we are staying here or moving to another state within the next year or so to be closer to some of our family. I'm gonna give this a go in our kitchen. I hope it works out! Thanks for the play by play you shared, it really helps to know what others think about products. This is by FAR the simplest way I've seen to do this…dare I try?! I LOVE the color with your appliances! hi! im your newest follower, i just started a blog about me and my fiance's adventures in redoing our first home as well! i want to say THANKYOU for this post! it is exactly what i needed…i have the UGLIEST laminate countertops, and until we can afford to replace them with something nice, ive been desperate for a way to make them “ok”. remember graphing paper from geometry class? thats what they are. except they are BABY BLUE. yuck. i will be going to home depot and picking this stuff up as soon as it gets warm enough out to do it! thanks again, love the blog! Kristen, I think I've seen those counters before, and I agree with you – yuck! Definitely wait until it's warmer. I'm relatively happy with the results of mine, but the can says that the paint should be done when the temp is between 50 and 90 degrees. I was too impatient, but glad I made the change regardless. I didn't know you could do that! We are kind of in the same place at you, saving up the money for a full renovation but not quite ready yet. We are going to be painting our cabinets this spring (once the weather is warmer) so I might have to try painting the counter tops too! Great job. They look wonderful! I totally would have done it, like you said worth the trial run before you're stuck with a pricier counter you have to live with. This paint is wonderful for those of us who just don't have the big bucks in the budget! Great Job and your kitchen looks great! Stop by and see my make over.. I feel your joy! I just found your blog and I'm now a follower! I've been thinking of doing this only in black and thanks for telling us about the temperture to wait and do it in. They look great–such a good solution for updating counters. Thanks so much for linking up to Beyond the Picket Fence. Wow, I've never heard of this product before! It turned out great, in my opinion. A good solution for a temporary fix to your problem counters. I've thought of doing this and considered getting one of those acrylic cutting boards that have the radius curve or right-angle lip to protect the paint where I usually cut. Now I have convince the landlord to let me. My laminate has a couple of gouges in it from previous tenants. I'm thinking of using Bondo to fill those in. If you want protection from the bad odors, you will need to get a mask with charcoal filter canisters. The mask you used is good for dust, but has little or no affect on organics. Thanks for the tip, dak! 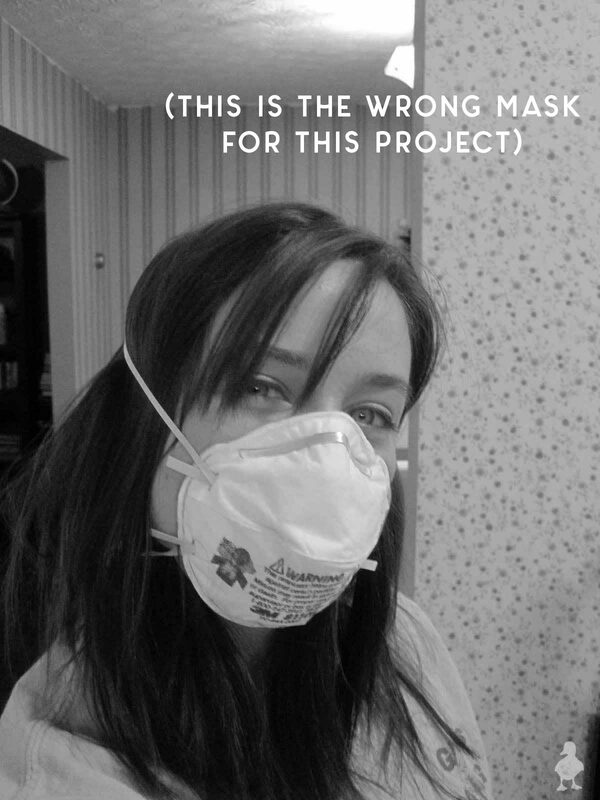 And you're right, in a more recent post, I mentioned the charcoal mask and will be using it for future projects. A fantastic tip for my readers. Peggy – sorry to hear about your allergies. I didn't know about the granite contact paper, but I'll keep that in mind! pS-i am your latest follower. I've enjoyed seeing your floor & countertop projects. I love your fearlessness! And I'm impressed with how handy you are. It's inspiring! Thanks for your blog I have ugly dark blue countertops that are horrible the people who lived here before me left them in a mess bleach stains looks like some kind of gresse stains I am wanting to redo are kitchen the blue tops dont even match the kitchen now so I am so glad I can paint them & not have to spend 1000s on new ones!!!! Oh gosh, much better on the counters! Great tutorial too, I've seen this product around and was curious about it. I linked this to my countertops project post today as well, nicely done! 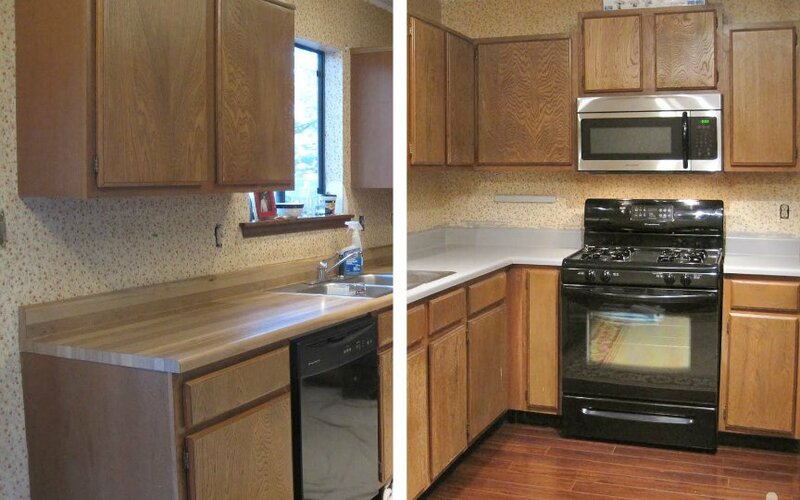 We painted our kitchen cabinets (laminate) and they lasted really well for 10 years! until we could afford to replace them. I just used oil based paint and would touch it up every couple of years. I think if you paint your cupboards white, you'll love the grey counters! wow I just discovered your blog! You are a dream come true for me, I have pink countertops! gag! I will be an avid follower of your bog, you keep things simple the way you explain, your photos are very helpful. I am cheap too but don't want to live in surroundings I hate. Thanks for your site. I love the transfromation of the kitchen you osted here. It gives me some incentive to do this with my own kitchen Thank You. Hi! I was looking through the internet to find out if there was actually a paint MADE for countertops because the apartment I live in painted EVERYTHING. Bathtub, counters, light switches. EVERYTHING. And they used really cheap paint because when I take a bath I'm coated in paint chips and when I wipe down my counters they stain and chip, too. So thanks for showing me there's something cheap out there! paint the cabinets black and add a grey/black backs-plash.Then it will look amazing! Just found your site while googling about painting countertops gray. I'm thinking of doing this in the house that we are buying from my in-laws. I'm thinking white cabinets, gray counters, maybe a beadboard backsplash and island. Great blog! Your kitchen's design matches the flooring perfectly. Well, I guess there is no need to repaint the kitchen cabinet. It is totally amazing as it is. Way to go! Great alternative if you don't have the funds to replace not so pretty counter tops! Love your writing style! Wow. What a SUPER FIND this blog was. I just purchased my first condo and it needs a little work but we all know the costs to get into the condo in the first place, so granite may have to wait a bit. This will work wonderfully! My current countertop is kind of a dark maurve color. Can I paint it with the lightest tint ok? Second question is I I take ownership Dec 27 and have until Jan 7 to put it into move in ready condition. If I leave the heat on while the paint dries will this be ok because obviously it's in winter (I will not be living there when I paint the counters though). This is such a good post! I am going to do this to cover ugly blue kitchen counters. Did you sand the counters before painting? How is it holding up almost a year later? Thanks!! Thank you so much for this blog. I recently relocated, and my new kitchen is mid 70's Electric Orange!!!! Seriously, I expected to open the closet and have Marsha Brady come dancing out. 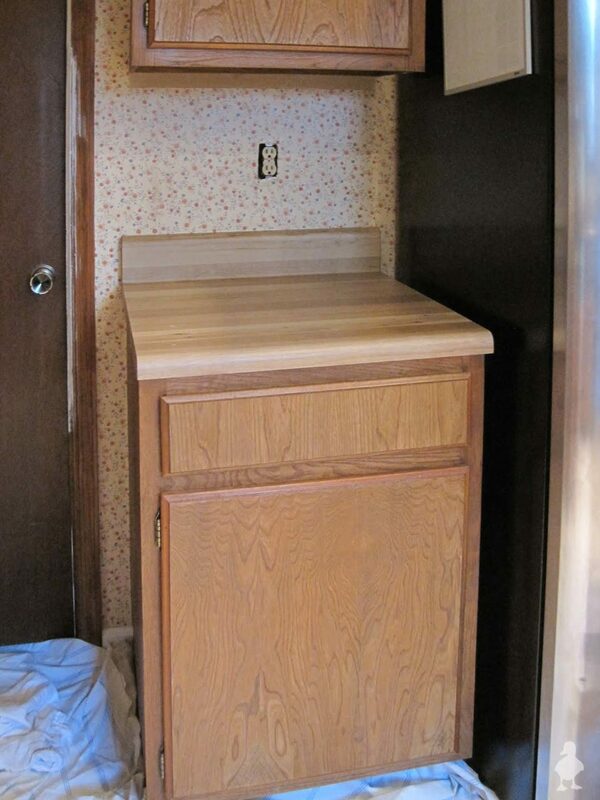 Anyways, with the relocation, money is tight, and I expected to simply use the counter top as part of my morning wake up routine…get out of bed, smell the coffee, fry retinas from reflected light from counter top, stumble into wall screaming I'M BLIND…..
Can I have your old cabinets and counter tops! I liked the before much better!! This is amazing! I have an ugly fauz butcher block counter that I cannot afford to replace. I am thinking of painting my countertop, I do have one question, now that you have had this countertop for a year or so how is the paint holding up? Is is peeling? or chipping at all? My husband is dead set against me painting the counter, so before I do I would like to hear feedback on the wear and tear. In the post above, I added a review of how they held up several months later (under the PSST section). I'm reposting it here too! It’s funny to me this is how I found your blog. My husband has a painting/drywall business and he had a customer who wanted her countertops painted. House manager/secretary/bookkeeper/IT wife (me) Googled and your blog was in my search. He ended up using the Gianni line to paint the countertops, and they turned out awesome. I have the same tacky faux wood countertops you had. Hubby will be painting any day now (or when he completes that next job, dog doesn’t need walked, he decided to whip up veggie soup, televised sports ceases,etc.). Oh well, he’s a keeper for the soup and a few other reason. Thank you for you blog, I have enjoyed every minute reading it that I should have been doing really productive things. Honestly it really is hard to come across a worthy blog worth commenting on these days, the internet is really too flooded. Adore this post, adore your blog. Just thought i would let you know! My mom's kitchen counters are pretty gross. I think they are original to the house (circa 50 years old, or maybe my parents had them put in, which would make them circa 30 years old). I have been considering doing this. It is good to know how much time it takes and the smell involved. you mentioned the high level of toxicity in the products. are you not concerned about preparing your food on these countertops, especially as bits start to chip and breakoff? Will these chemicals continue to off-gas and break down potentially contaminating your food and anything that they come into contact with? i too have been looking to redo my countertops and am finding it hard to find green products. so far everything that I have looked at is highly toxic. Good point. I would never think that preparing food directly onto a painted counter would be a good idea, whether the paint was considered safe or not. As for the long-term toxicity of any painting product, it would probably be a good idea to contact the manufacturer directly if you're concerned about off-gas. I'm not much of a cook, and this was an experimental project so I plan to replace the counters entirely next year. Thanks for sharing.I want to do this to one of my bathroom counters. love your blog! I have done several countertops with paint and have tested against manufactured tops and you would be surprised at the results. If someone spends some time researching products and talking to people who have painted countertops, you will save $$$$ in the short and long road. Bottom line… just because it comes from a store or factory does not mean its a good quality product. I built mine from the ground up and have no regrets doing so and according to the test results, they should be around for 20+ years. I too tried this paint on my counters in the kitchen. (We chose cobblestone.) The Home Depot folks assured me that I didn’t need any kind of poly coating that this stuff would bond to the laminate and wouldn’t need a protective coating. Too bad I didn’t hear them snarking “Sucker!” as a walked out of the store. But seriously, for a month or two, this was fine. Then someone got the counter wet, did not dry it and laid a loaf of bread on the damp spot. That counter has perma bread logos stuck to it. And the chipping, my goodness. The chipping is unreal. Innocently setting an air fresheners and other unlikely substances will take the paint right off without some sort of poly barrier. I’m going to try the spread stone kit and if that doesn’t work out, we’ll just plan on replacing the counter tops eventually when we have the money (which may be never). I would not recommend this stuff. It doesn’t look all that great, doesn’t have any depth, and doesn’t hold up to kids or husbands. Good luck on your counters! Sorry that you had such similar results. The counter looks great! 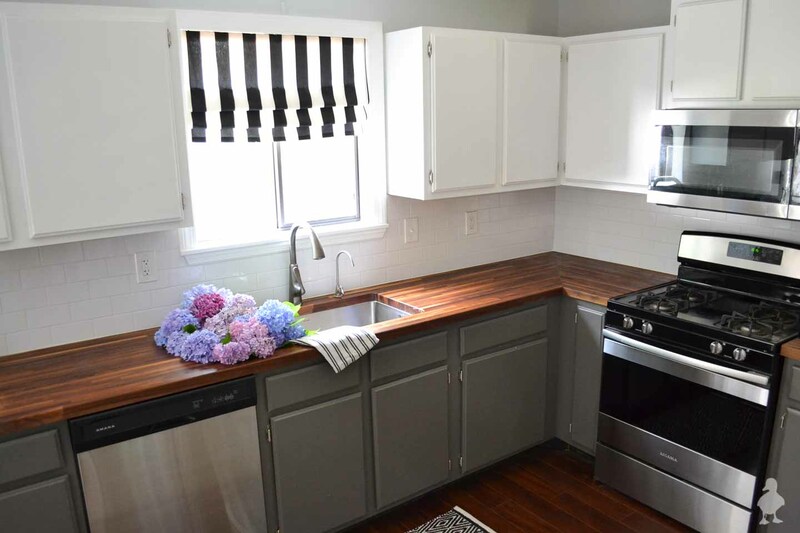 And I agree with other comments…paint cabinets white, add silver hardware, tile backsplash, remove wallpaper and done! Def have good bones to work with even tho it appears ugly. Ours was old oak cabinets that were so filthy wig carpeted flooring and a drop in avacodo colored stove and a new floor, light gray painted cabinets and new paint and I love it! Feel free to send me pictures, I love a good before + after! How about… Damn your hot! I like a girl that’s not scared to get dirty and take a chance. Your blogs are awesome too. I love this! 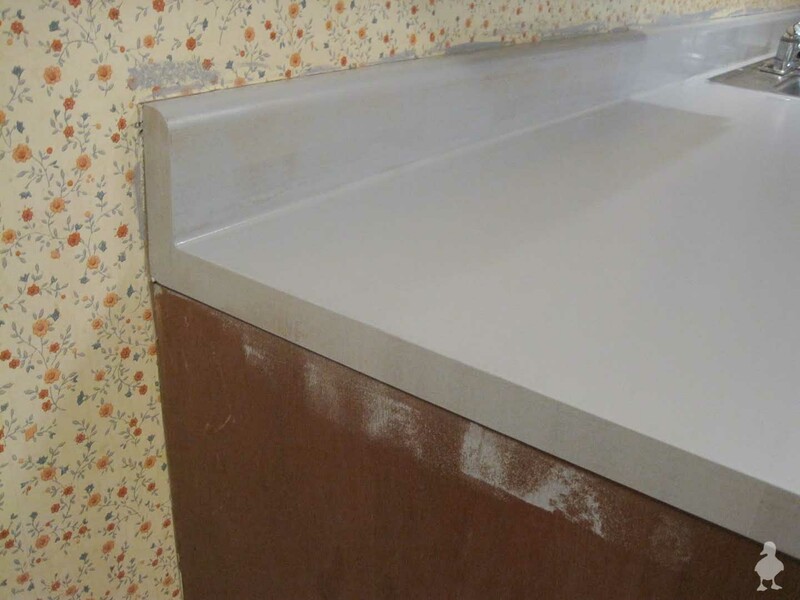 I am considering this product to cover an old formica countertop that was installed in the late 50’s so it was nice to read about your experience. Two questions: how long did you wait before applying the second coat? and, did you use a brush to cut in before using the foam roller? Unfortunately, at this point I can’t remember how long I waited. But the back of the can of paint should tell you waiting time between coats. And yes, I used a brush for some places, but as you can see from the pictures, I wasn’t super careful. I knew I’d eventually get rid of them, and wasn’t too concerned that I got the paint on the wallpaper or the cabinets. I’d recommend using painter’s tape to protect your walls and surrounding areas. nice job with the painting. i think i will give it a shot. I owned a condo which has very old yellow formica. I contacted a painted and he sprayed the countertop with white apoxy paint and the countertops were beautiful and lasted 10 years plus before I replaced them. They had very few marks in them despite the fact that this condo was a rental. It costs me only $100 for this service and well worth it. Thanks for sharing. I am also looking at trying to redo my countertops and will be experimenting. Not sure how they will turn out but am going to try something differently. I wanted a marble look so I had bout 3 different colors in this product and will sponge it on and go from there. Even though it doesn’t call for a primer I wanted a black base so I could have some black in it as well. It will definitely be an experiment! Thanks for the heads up with the smell!! Found your website and wanted to ask a question – we just did our countertops this weekend. We see stripes from the foam roller on the countertops though – any thoughts on how to get rid of that? By stripes, do you mean streaks, visible ridge-like lines from using too much paint, or just uneven sheen? When applying paint, it’s always a good idea to apply in a “W” pattern, which helps to avoid all three of the issues I listed. I came across your post on Pinterest because I am on the hunt to improve my parent’s house because they need an upgrade! Does this work on formica? No idea, but good question. 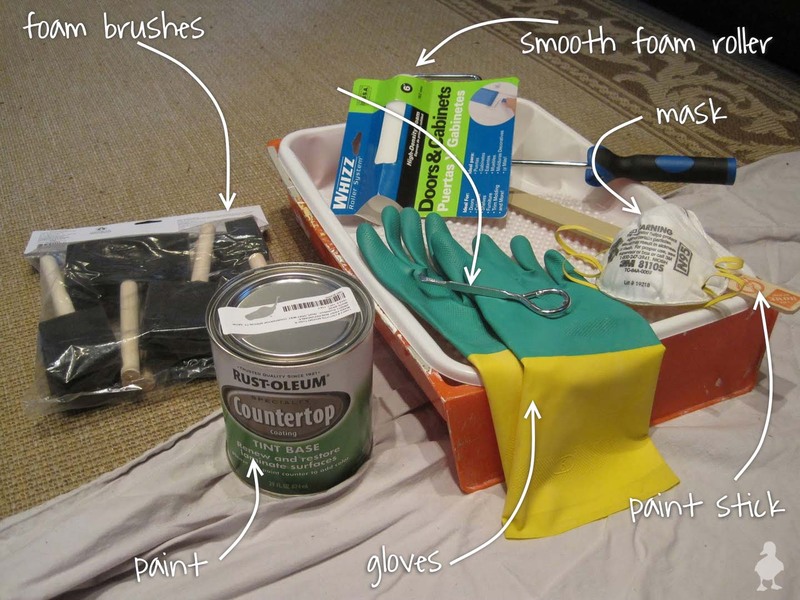 I used it on laminate counters and experimented by trying it on linoleum floors; it’s an epoxy paint. You would have to check the back of the box or call the manufacturer to see what other surfaces it’s been tested with (or try it out and see what happens… that tends to be the way I go!). I always picked this project as a temporary thing until I installed new counters, which I’m much happier with. Thanks for your help! I will definitely look into it. Hi there. I looks great. I bought this kit over the weekend, but I returned it after realizing I’d have to remove the sink. Is that necessary? I have a top mounted sink. If you bought a kit, that might be a different product than what I blogged about. 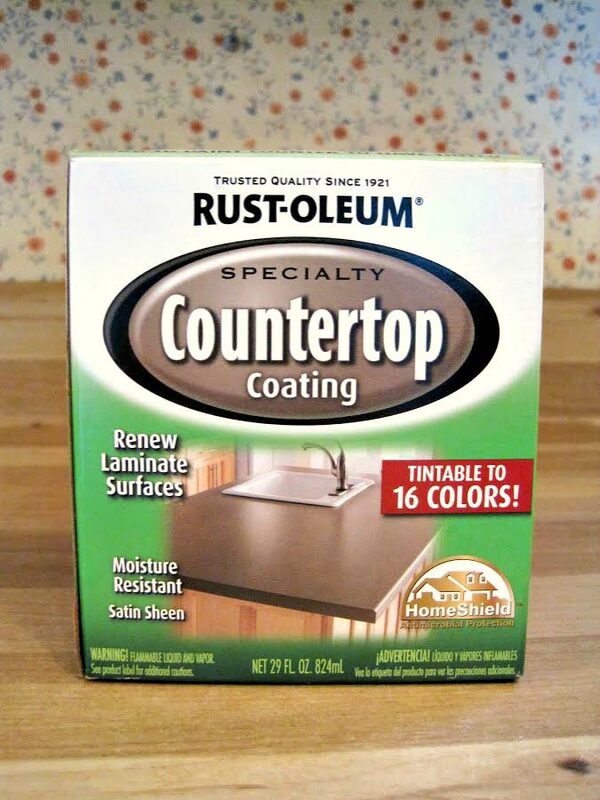 Rustoleum sells more than one countertop painting product; one is cheap (the simple box of paint I used), and one is much more expensive and has a longer process with several steps involved to give you a long-lasting finish. But to answer your question, I didn’t have to remove my sink. I think that, based on the pictures, it looks really good. Better than it did before. Although it no doubt looks different in person, which could explain your “Meh” response to it. Hi – great countertop idea. I have painted just about everything in my cottage kitchen except the counter and I really want to try the Rustoleum product you used but I can’t find it anywhere. I live in Ontario canada – any idea how I migt track some down? I have wanted to try this for years. You mentioned the paint stick came in handy? Do you mean the paint stir stick or something else? My laminate counters are lavendar and before I pay over $1500 to tear out and replace I would like to try this. What colour and brand of paint did you use for your kitchen cabinets? Thay look great!! The top is Decorator’s White and the bottom was Seal, but both were color matched to a Benjamin Moore line. I covered most of the details in this post with some in-progress pics as well, so you can see what it looked like as things were going in! Hope that helps! Thanks…just found your site…luv it! My husband extended the countertop in our farmhouse. He left room for a dishwasher. We’re awaiting the new formice for the extended counter top. Since the 2 don’t match, I’m going to paint them for a cohesive look. We’ve already painted the cabinets an country white. Our grand daughter moved in our farmhouse this yr, after graduating high school. a deep red. The oppositie wall from cabinets is also deep red. I’ve yet to get new trim on cabinets & around the ceiling. It’s a work in progress, but we’ve had fun redoing it. My next project is taking laminate wood off of an dresser. I’ve almost got it off. It’s solid wood underneath, so I’m going to stain the top in a dark color & paint the rest white. I’m going to make a vanity for the bathroom out of it. All the wood trim is painted white & it pops with the deep red & country white. I’ll send you photos. Thanks for this! I’ve been having a think on painting my counters for a while (I have the same faux – wood laminate whatever-it-is) in my 93 year old cottage. The point of it is lipstick on a pig until I can gut the whole thing. I think it definitely gives it a fresher, cleaner look and the butcher block is absolutely gorgeous! I am currently doing this project, same product, I used earth because I wanted a big change. It looks fabulous with just the basecoat, the counters were oatmeal color and ugly as can be…i am going to add black, sand,butter pecan, bronze and a touch of gold. I love this product, one can did a lot of counters in my motor home. 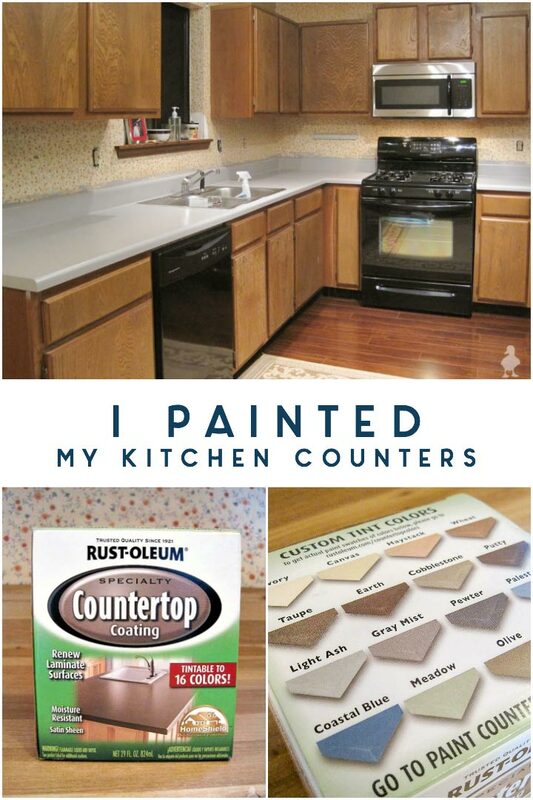 The smell was not that bad, honestly…open windows, turn on a fan after you get your counter done…i would use this paint again…thanks rustoleum!!! You made my kitchen so beautiful!! I love your black and white Shade. Where did you find it? Also, were your happy with the gray mist color? I want an almost concrete look. Cute blog! Keep it up! Check out more updates on my kitchen here to see what it looks like now! The painted look was temporary, so I would say that it was enough for what I wanted short-term (it’s got a slightly bluish tinge, TBH). I think that it would do ok for a concrete look but you might have to add a glaze or something on top to make it look more like the real thing, or you could do a thin concrete coating (I’ve seen other bloggers do it and claim decent results, dunno how long it lasts though). As for the black and white shade, it is a DIY that I made! You can find that tutorial here.